Mark Fletcher got his musical foundation on the piano after which came classical and flamenco guitar styles. The complex finger work of thes e styles allowed Mark to adapt to other instruments quickly. Mark is known for his multi-instrumental skills and in any given performance with the Steel City Rovers can glide from Scottish smallpipes to mandola, accordian or Irish Whistle. Mark has been active in the music industry for close to 40 years, playing his first professional gigs at age 16. 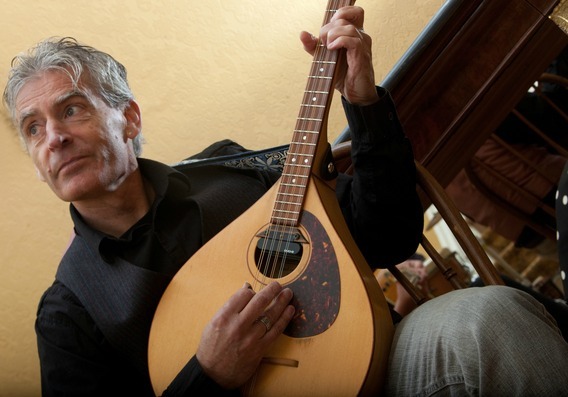 Over time he has performed the music of many genres, been the architect of many well known Celtic ensembles and contributed his musical skills to nearly 40 recordings. The Steel City Rovers will be at Chestnut House Concerts on Thursday, June 18, 2015 at 7:00 p.m. Prior to the show at 6:00 p.m. will be a potluck; reservations can be made by a text/call to Tim at 71794 09311, or an email to tlehman9@gmail.com. This entry was posted in For Your Information, Upcoming House Concert and tagged Celtic, Irish Whistle, mandola, Mark Fletcher, Scottish smallpipes, Steel City Rovers by chestnuthouseconcerts. Bookmark the permalink.